Phytoplankton and zooplankton, microscopic marine organisms which play crucial roles in complex ecological food webs, are sensitive to UV radiation. Because UV-B radiation is absorbed by only a few layers of cells, large organisms are more protected, whilst smaller ones, such as unicellular organisms in aquatic ecosystems, are among the most severely affected by UV radiation. Depletion of the ozone layer could have drastic effects on plankton and other small marine organisms at the base of the ocean food chain. These creatures are highly sensitive to UV radiation because they lack protective outer layers. The increase in UV radiation threatens growth and survival of the tiny creatures that provide the original food source for the rest of the ocean food chain. 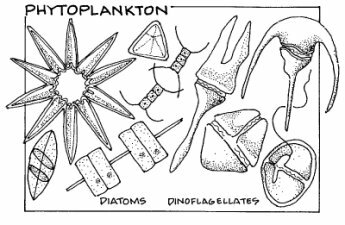 Plankton form the foundation of aquatic food webs. Plankton productivity is limited to the euphotic zone, the upper layer of the water column in which there is sufficient sunlight to support the photosynthesis of food. Since UV radiation has the ability to penetrate up to 20 metres down in clear water, plankton and other light dependent organisms often experience cell damage, much as human DNA can be damaged by the strong solar radiation. Both plant (phytoplankton) and animal (zooplankton) species are damaged by UV-radiation even at current levels. As with certain land plants, some species are more sensitive to UV-light at critical stages in their life cycle, and changes in radiation may shorten the breeding period to intolerable levels. 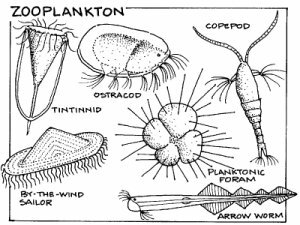 As plankton make up the base of the marine food chain, changes in their number and species composition will influence fish and shellfish production world-wide. These kinds of losses will have a direct impact on the food supply. Here you can read more about other ozone depleting substances. Solar UV-B radiation has also been found to cause damage to the early developmental stages of fish, shrimp, crab, amphibians and other animals. The most severe effects are decreased reproductive capacity and impaired larval development. Even at current levels, solar UV-B radiation is a limiting factor, and small increases in UV-B exposure could result in a significant reduction in the size of the population of animals that eat these smaller creatures. Ozone Hole Website informs you about the research indicating that many plankton species already seem to be at or near their maximum tolerance of UV radiation. Thus, even small increases in UV-B levels may have a dramatic impact on plankton life and on entire marine ecosystems. Some research suggests that ozone depletion is more likely to change the composition of living organisms on the ocean’s surface than to reduce its overall mass. If ozone-layer depletion reached 15% over temperate waters, it would take less than five days in summer for half the zooplankton in the top metre of these waters to die from the increased radiation. Additionally, large amounts of young fish, shrimp and crabs would die before reaching their reproductive age. Less food would be available for adult fish and other higher forms of marine life, and therefore for human consumption. This is of particular relevance, as more than 30% of the world’s animal protein for human consumption comes from the sea. One study of plankton estimates that a 25% reduction in ozone would lead to a 10% loss in primary production throughout the sunlit, biologically rich upper layer of the ocean, and a 35% reduction near the surface of the water. Effects of the ozone hole in Antarctica have already been seen in some of the organisms. Most of the Antarctic organisms have a low tolerance for UV radiation since for most of the year, hardly any direct sunlight reaches the continent. With the reduced ozone in springtime, UV-B radiation has been able to penetrate the atmosphere with a higher intensity. Already, on the base of the Antarctica food chain, an impact has been felt. UV-B radiation has already reduced the plankton populations by between 6% and 12%. Consequently, species higher up have felt the impact.